A day after I joined THISDAY from Concord Press in February 1999 as deputy editor of The Sunday newspaper, I was directed to proceed to Kaduna to cover the presidential primaries of the All Peoples Party (APP) then chaired by the late Senator Mahmud Waziri. As I recall, some of the aspirants jostling for the partyâ€™s ticket were Chief Arthur Nzeribe, Chief Emmanuel Iwuanyanwu, the late Dr Abubakar Olusola Saraki, Dr Ogbonaya Onu, Dr Bode Olajumoke and Chief Harry Akande who added razzmatazz to the occasion by flying into the city in his private aircraft which was parked at the airport and said to be loaded to the brim with bundles of new naira notes! However, for three days in Kaduna, we were treated to a most bizarre political drama. From Hamdallah Hotel to Airforce Club to the Ahmadu Bello Stadium, the party leadership took us (journalists, party delegates and aspirants) on a merry-go-round as to when the convention would hold and where. At a point, a frustrated Saraki accused Waziri of attempting to rig the process and in turn, the APP chairman called a press conference where he displayed the copy of a cheque for N30 million with which he said Saraki tried to bribe him. At the end of all the shenanigans, we witnessed no primaries but that is no problem for Nigerian politicians. The name of Onu was announced as having secured the partyâ€™s presidential ticket. Barely 24 hours later, the same APP leadership announced in Abuja the name of Chief Olu Falaeâ€”who had earlier been picked as the Alliance for Democracy (AD) presidential candidate by a conclave of 21 Yoruba elders who sat in Ibadan after administering an oath of secrecyâ€”as their joint presidential flag-bearer for the election. Meanwhile, when the local government elections were held two months earlier on 5th December 1998, the electoral guidelines had clearly stipulated that for any party to be registered, it must score at least a minimum of five percent of the total number of votes in no fewer than 24 states. Yet, despite the fact that the AD did not meet this particular threshold, it was registered as one of the three parties by the Independent National Electoral Commission (INEC), essentially to secure the buy-in of the South-west in the political transition programme to which many Nigerians were very suspicious. It was against this background that Onu ceded the APP presidential candidacy to Falae and it became very clear that some forces, especially within the military establishment, were pulling strings along a predetermined direction. That became even more evident when a certain General Olusegun Obasanjo, who ordinarily should not have been allowed to contest the primaries if there was strict adherence to the provisions of his partyâ€™s constitution, became the candidate of the majority Peoples Democratic Party (PDP). The partyâ€™s guidelines had specifically stated that anybody who failed to secure his ward for the party would be disqualified from contesting. Not only did Obasanjo lose his ward, he lost the polling booth where he voted in all the elections. And for the first time in the history of our country, the two candidates for a presidential election were from the same ethnic group (Yoruba) and both were Christians. Nobody needed to be told that the 1999 presidential election was contrived to appease the Yoruba people for the injustice done to the late Chief M.K.O. Abiola, the acclaimed winner of the 12th June 1993 presidential election. But the trouble with the arrangement was that, with all the cards stacked in favour of Obasanjo, majority of the political elite in the Southwest saw the 1999 election as a deliberate act of provocation, especially where June 12 and the memory of Abiola were concerned. And it proved to be so because if there was anything Obasanjo never wanted to hear throughout his period in office, it was Abiola and June 12. For him and his enablers from the north who helped him to power, both Abiola and June 12 should be consigned to the dustbin of history. What the foregoing says clearly is that there have been some cynical attempts in the past to deal with the June 12 challenge by those who misread history and its varied lessons, even though some find convenient excuses in the contradictions in the social, political and business life of Abiola (and there were many). Then came President Muhammadu Buhari, the last person you would imagine could honour Abiola or remember June 12, given what transpired after that election in the north aside from the fact that he had made some uncomplimentary remarks about Abiola in the past. But, in a way, it is also providential because Buhari is perhaps the only northern leader with sufficient clout for such a decision without any serious political backlash within his traditional support base. The question is: Why did he do it? Falae has a point. 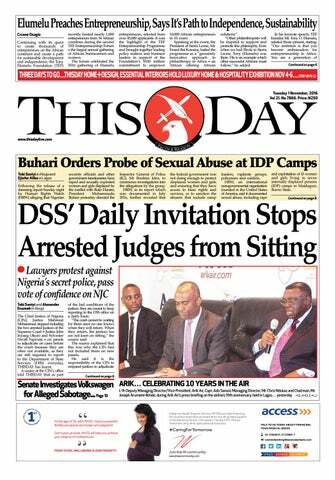 Why, for instance, was Mr Olisa Agbakoba, SAN, not invited to Aso Rock on Tuesday? On the day the late General Sani Abacha, then as Chief of Army Staff but based in Lagos, ordered troops to mow down hundreds of citizens protesting the annulment of June 12 on the streets of Lagos, Agbakoba was the poster boy for the resistance with an iconic photograph of his bloodied face (after he was brutalized by the military) taken by the AP published in several newspapers across the world. How can we forget Colonel Abubakar Dangiwa Umar, one of Nigeriaâ€™s most respected officers with a glittering career, who resigned his commission because of June 12, a decision that could jolly well have cost him his life under a different circumstance? And then we have the patrons of the National Democratic Coalition (NADECO). Chief Cornelius Adebayo and the late Chief Anthony Enahoro were arrested and detained for years before their release after which they fled to exile to join others. What about Prof Bolaji Akinyemi, Admiral Ndubuisi Kanu, Ms Gloria Kilanko, Chom Bagu, Joe Okei-Odumakin, Chima Ubani, Festus Iyayi and several others who risked their lives confronting the military over June 12? Even within the armed forces, there were heroes. Both Admiral Alison Madueke, then Chief of Naval Staff and General Mohammed Chris Ali, Chief of Army Staff, were removed by Abacha following a tense Provisional Ruling Council (PRC) meeting where they broached the issue of Abiolaâ€™s continued detention. Chief Ajibola Ogunsola revived PUNCH newspaper after the death of the late Chief Olu Aboderin yet on June 12, he put everything on the line. In fact, on the day Abacha was proscribing Concord and PUNCH to render many of us redundant for several months, his anger was directed at the latter. â€œConcord I can understand since it is owned by Abiola so it is human that his boys would be attacking me but PUNCH; what is their own?â€ asked Abacha that day. While there will be a day to remember those who fought for our democracy, including some upwardly mobile men and women then in their thirties and forties who acted as â€˜Concerned Professionalsâ€™ (Atedo Peterside, Pat Utomi, Oby Ezekwesili et al), let us deal with the speculations as to why Buhari honoured Abiola and make June 12 Democracy Day. As much as I subscribe to the notion that given the timing, the action is very political, even opportunistic, I am also aware that Buhari is not the kind of man who would take this sort of action without conviction, no matter the political implications. So, I believe he took the decision because he feels it is the right thing to do and he deserves to be commended for it. Besides, the â€˜Not too young to runâ€™ generation in the Southwest who now constitute the electoral majority may admire the spirit of June 12 based on the stories they are told by their parents but if you follow them on Twitter, they are more concerned about issues that directly impact on their lives. So, nobody should overplay the vote issue to diminish the significance of what President Buhari has done just as I abhor any recourse to provincial triumphalism that can only be counterproductive in a diverse society like ours. That precisely is the point many of the commentators miss. June 12 goes beyond the person of Abiola and what he may have represented in the past. It is not even about what happened that day, as significant as the voting pattern (Muslim-Muslim ticket securing the votes of Christians) was. It is about what happened afterwards, when several Nigerians stood up to the military and paid heavy price for demanding that the votes they lawfully cast could not be so cynically taken away. Of course I am well aware that at that period, there were also those who bought into the divisive politics of the military and decided to accept the peace of the graveyard. Those who have always imputed ethnic motive to that principled stand taken by Yoruba people for the stubborn refusal to abandon June 12 forget that Chief Ernest Shonekan, like Abiola, is an Egba man yet he was rejected and so was Obasanjo in 1999. Therefore, the issue was never about having a Yoruba man in Aso Rock; it was/is about righting the wrong of June 12 in a manner that would take into cognizance the supreme sacrifice paid by Abiola and several people without which the military would never have returned to the barracks. That is why the symbolism of upstaging May 29 for June 12 as Democracy Day in Nigeria should not be lost: It is an affirmation of the supremacy of the ballot over bullet! The damage inflicted on the psyche of Nigeria by the annulment of the June 12 election was enormous and to understand how divided the country had become just a few weeks after ordinary citizens had cast their votes for a united nation, I reproduce below an abridged version of a chapter in my book, â€™POLITRICKS: National Assembly under Military Dictatorshipâ€™ which captures the debate that followed the annulment of the election in the Senate that had at time been inaugurated under a curious political arrangement. General Babangida had on 17th August 1993 addressed a joint session of the National Assembly to propose an interim government to with the aim of conducting yet another presidential election, following a â€˜tripartite agreement between the military and representatives of the two political parties, the defeated National Republican Convention (NRC) and the SDP whose leaders were trading away their victory without Abiolaâ€™s support. At that period, the Senate, presided by Dr Iyorchia Ayu, had such members as Hamman Bello Mohammed, Chuba Okadigbo, Uba Ahmed, Paul Ukpo, Bola Ahmed Tinubu, Sunday Bolorunduro Awoniyi, Rasheed Ladoja, Ahmadu Idah Ali, Benneth Birabi, Ebenezer Ikeyina, Kanti Bello, Wande Abimbola, Magaji Abdullahi, Kofo Buckor Akerele, Idris Kuta, Aniete Okon, Paul Wampana and several others while the House led by Agunwa Anaekwe had Tehemba Shija, Lazarus Unaogu, Nicholas Agbo, Tokunbo Afikuyomi, Florence Ita Giwa and others. I am sure readers will find the debate that followed Babangidaâ€™s speech very instructive. All said, what President Buhari has done on June 12 is not only significant, it has shown very clearly that he has the capacity to rise above certain narrow and clannish interests to do the right things, including rallying the entire country for the healing and reconciliation that is very much needed across board, if we must attain peace and prosperity. It is therefore my hope that the president can apply the same disposition to deal with the economic/lifestyle problems that now endanger inter-group relations in the North Central with dire implications for sectarian divisiveness as well as the â€˜five percent versus 97 percentâ€™ mindset that has almost alienated the entire South-east from his administration. While these issues belong to another day and we will deal with them appropriately, President Buhari made the right call on June 12. But can he seize the moment or is it already too late in the day? I owe so much to Waziri, who clocked 50 only yesterday but far wiser than his age. He is a friend in a million. Happy birthday, my brother! Two days after General Ibrahim Babangidaâ€™s address the committee of the whole Senate on 19th August 1993 deliberated and took a decision at a session presided over by Dr. Iyorchia Ayu as chairman. Excerpted below is an edited version of the session. The Chairman (Senate President Iyorchia Ayu): Well, distinguished colleagues, we are now at the Committee Stage, and the Floor is now open for deliberations from every Member of the Senate. Senator D.K. Azinge (Delta North): The distinguished chairman, and the committee, I will like to make a little observation. We are now in committee; and in my view, we are all here to deliberate on a very sensitive issue. While respecting the efforts of the press so far in assisting us to develop and air our views to the general public, I wonder whether we would not enjoy a frank deliberations if we clear the gallery. The Chairman: I beg to rule that we cannot clear the gallery. This is because this address was presented in full view of the people of this country, and I believe that our deliberations should equally be public. It is a matter of intense public interest. I therefore, do not see anything that is too sensitive that the press cannot cover. I think we would have even appreciated it if there were more people in the gallery to listen to our deliberations. Senator S.O. Iyahen (Edo State): Mr. Chairman, distinguished Senators, I join in thanking the President and Commander-in-Chief of the Armed Forces of the Federal Republic of Nigeria, General Ibrahim Badamosi Babangida, for his address on the Senate of the nation on August 17, 1993. The focus of his address is on a very serious problem we are facing today as a nation. That is, the problem of getting an elected President together with a civilian administration to take over from this military administration. The problem arose from the annulment of June 12 election. The address of Mr. President and Commander-in-Chief also includes the federal military government thinking in terms of a solution to the problem by the idea of an Interim National Government. For myself, I look forward to getting details of this, including the enabling decree, as promised, so that we can discuss and make decisive recommendations. The availability of such information is very necessary for one to be able to make any serious comment. My senatorial district contains very simple people. They are not complicated at all. Maybe this is part of the problem. I have mentioned earlier on that the main problem we have in my constituency is about understanding the reason for the annulment of the June 12 election. About a year ago, the presidential primaries were cancelled and we were asked to repeat the primaries. Everybody agreed with that decision because the reasons were clear.Â My constituents find it difficult to understand why this particular one happened. Despite serious efforts made to explain the situation to my people, the most serious thing I have heard is that this was a coup. My people do not want a coup. We do not want a coup from military to military, how much less from military to civilian or civilian to civilian. As I said, my people do not want a coup and they find it difficult to understand. I am sure many people have this problem. The military has annulled the June 12 presidential election, asking us to move forward. But it is difficult. We have tried our best to explain, but I want to assure you that up till now my people cannot understand the basis of that action. The Chairman: Please, this matter is of great public interest, and I would like as many Senators as possible to contribute. Several Distinguished Senators: All of us!! Senator Hamman Bello Mohammed (Adamawa Central): Mr. Chairman, distinguished colleagues, in the speech that was made by my distinguished colleagues so far, I have noticed a contradiction. Senators were bringing up the question of the June 12 election and indicating that they do not understand or that their constituencies do not understand the annulment of this election and indicating as if they do not agree with the annulment but at the same time, asking that certain provisions of the constitution be invoked and our president be made the president of Nigeria during the interim period, how could that be? Our president cannot be made the President of Nigeria during the interim administration unless we accept that the June 12 election has been annulled.Â (Laughter) Mr. Chairman, distinguished colleagues, we are the Senators of the Federal Republic of Nigeria, we are elderly people in this country. We are leaders of people in this country. We are also politicians. I think that in whatever we do, we own responsibility to this country and also since we are leaders and elderly people, we must tread the path of realism when important and serious national issues are concerned. June 12 was not the first time that that the military intervened in this country. The military intervened in this country in 1966 and our people did not understand why they did. I will tell you that my people did not understand why the military intervened in 1966 and killed the Sardauna of Sokoto. It is a fact and we accepted it. We accepted it and we moved on from there. Further to that, the military intervened in 1974 or 1975 and removed General Yakubu Gowon. A large section of this country also did not understand but moved on. But before then General Ironsi was removed and killed, and a large section of this country did not understand why he was removed and we had to regard it as a fact that it happened. We fought a civil war and after the war, we came together as one people with common destiny and we moved forward. These are facts that happened. General Gowon was removed, a large section of this country did not understand why. (Interruptions). Senator M. Babatunde Osholake (Ogun Central): Point of Order. The Chairman: Senatorâ€¦ (Interruptions). Where are the Whips â€“ the Majority and Minority Whips? What is the order? Order 73 deals with the election of the committee, so what order are you referring to? Senator M. Babatunde Osholake: Order 37 (3), in the committee of the whole senate, contributions shall be very brief and must be relevant to the subject. What Senator Mohammed is doing is trying to whip us sentiment. We are not here to talk about war. The Chairman: Point of order overruled. Senator Hamman Mohammed should proceed. Senator Mohammed: Similarly, Mr. Chairman, General Gowon was removed in this country and a large section of the people in this country particularly from the Middle Belt, were unhappy. They did not understand why; we forget about it and we moved forward as one nation with a single destiny. Alhaji Shehu Shargari was removed, General Murtala Mohammed was removed and killed. A lot of the Northerners did not understand why it was done. But it was accepted and we put it behind us and moved as one nation with one destiny. The political transition programme came. The presidential election came. We had elections at the local government level, state level and federal level with decrees which were carried out by the military. When we came to the presidential election, we went all the way from the primaries et cetera and certain people were elected. In the case of SDP, the highest policy making body in the party endorsed Major General Shehu Yarâ€™Adua (rtd) and in the NRC, we had Alhaji Adamu Ciroma and Alhaji Umaru Shinkafi and we were ready to go on run-off. The election of 23 leading Nigerian politicians was annulled. They said nothing and nothing happened and we put it behind us and we moved on as a nation. In June 1993 the military allowed us to go for election. We had the election but only a fraction of the results were declared before the military stepped in and annulled the election. The people from a section of this country who are our brothers, some of my best friends are from that section of the country who feel aggrieved. My heart bleeds with them and I sympathize with that section of the country because this is something which their leaders have been looking forward to for nearly half a century. But now, when it is almost within their hands, the military stepped in and they did not get it. Obviously, it is normal; it is natural for them to feel aggrieved. It is normal and natural for them to feel offended and it may even be normal and natural for them to feel rejected in this country, but I want to beg them and I want to pray that they should please forgive the military and forget about the military, and think about Nigeria as a nation (Applause) What has happened to them has also happened to various sections of the nation. I plead with them, I beg them, I beseech them, for the destiny of our country because this country is a country of high destiny and we are people of destiny. For this reason, I beg them to please contain themselves. Let us, as leaders of this country, forget about June 12 election. It has been annulled; let us forget about it. There is no going back. Let us look forward; let us not look backwards and let us move with our people. This country will stay for thousands and thousands of years, and as Chief Awolowo once said, this country is going to become one tribe very soon and it is moving towards that direction, with people working together and people living together in this country. This country is going to be one tribe very soon. That was what Chief Awolowo said. So, please, Mr. Chairman, distinguished Senators for the good of this country, let us forget about June 12 election; let us move along. We have all come together, the majority of us have accepted the interim government. Let us accept it and let us see how it could be brought in place for the good of our country before we get an elected civilian president. If it happens that the President of this distinguished House is made the President of the Interim Government, I will feel very honoured and every member of this Senate will feel very honoured. So, let us forget about the June 12 election and let us move forward. This is my plea, Mr. Chairman. Senator Ahmadu Idah Ali (Kogi East): Point of order, Sir. My point of order is Order 5 (7) and it reads as follows: On Mondays, Tuesdays, Wednesdays and Thursday, motion may be moved at the commencement of public business or before 5.45 p.m. to the effect that the proceedings on any specified business be exempted from the provisions of these Standing Rules, and if such motion be agreed to the business so specified shall not be interrupted if it is under discussion at 5.45 p.m. until such business has been disposed of. Senator Ahmadu Ali: So, Mr. Chairman, the implication here is that we shall continue this debate till even 9.00p.m. Senator Mohammed Ubale Shittu Magama (Jigawa East): Mr. Chairman, distinguished colleagues, as much as we would like to go on beyond six oâ€™clock or until tomorrow, if you like, I do not know whether Nigeria is sinking tomorrow or what. Why can we not adjourn and if we like, we can go on tomorrow. We can always convene tomorrow, if we like, and if not, we can continue on Monday. The matter is so crucial that some of us will get tired. The Chairman: Distinguished Senators, let us understand ourselves. The motion itself has an in-built counter. If it is carried, it is carried, and if it is not carried, we will follow our Rules. So, there is no need for any counter motion. I therefore, overrule the distinguished Senator from Lagos East (Senator Adefuye).Â He should sit down, and please allow the Senate to proceed. If you defeat the motion, fine, but I shall proceed to put the question on Senator Aliâ€™s motion that we continue deliberations until 9 oâ€™clock. Question put. The Chairman: I think the Ayes have it. Resolved: That the Senate continues its deliberations beyond 5.45pm until 9 pm; pursuant to Order 5 (7). Senator A.J. Ukpanah (Akwa Ibom North West): Mr. President, distinguished Senators, I am very thankful to God who has made it possible for me to reach this esteemed position in the Senate whereby I join all true compatriots to eulogise, even to sing sonnet upon the person of General Ibrahim Badamasi Babangida, President and Commander-in-Chief of the Armed Forces for the state of the nation address that he made to the joint session of the National Assembly. Sir, here is a man; here is a military person who has done so much for the ordinary people of this country.Â He created more States; he created more Local Government Areas. He established DFRRI and I know what DFRRI has done for my people. Now, the time has come for him to take an exit from the public affairs of this country and he came and addressed this distinguished Senate. With regard to the establishment of an Interim National Government, Sir, there can be no going back. The political parties have cooperated to come out of the state of confrontation in the interest of this great country. With the ultimate desire of maintaining the corporate existence of Nigeria as an indivisible entity and the strengthening of the body polity which is all what we are here about. For now, individual ego does not count.Â I urge those who have taken extreme positions to reconsider their stand.Â This is not the time for that because most of the Senators here were born before Aburi. We heard of Aburi â€“ â€˜On Aburi We Standâ€™ and we sometime now hear of â€˜On June 12 We Standâ€™. All that should go to history because â€˜On Aburi We Standâ€™ had disastrous consequences and we do not want a repeat performance.Â Mr. Chairman, what all that had happened mean is that Nigerians have been weary of military government and are prepared to move, one, two or three steps forward by coming together to accept an Interim National Government. By returning to the National Assembly the power that belongs to the National Assembly all that should concern this distinguished audience Sir, is to bring in input as to the modalities. I want to say, that I welcome by whatever name, a law that is going to be presented to us that will make all other laws irrelevant. That means that we will have a supreme law to work on which is entirely what the National Assembly should concern itself about. The Chairman: Thank you very much, distinguished Senator Ukpanah. May I just interject slightly by saying that those who are making important reference to history should also bear in mind that may be because our people did not say No when these interventions took place, things have continued to repeat itself with disastrous consequences and that now our people are beginning to say No to military rule. That point, too, should be emphasized as history is cited.Â (Applause). Senator Benneth Birabi (Rivers East): Mr. Chairman and distinguished Senators, I am happy that we are beginning to take cognizance of history because there can never be a today if there was no yesterday. I do not want us to lose sight of the fact that the compromise situation that Nigeria has found herself in vis-Ã -vis military intervention and military rule did not start from the life of this Senate. We have come to meet this situation and we are only going to do what is humanly possible to resolve the situation so long as we do that without compromising, the integrity, unity and peaceful co-existence of Nigeria. Having said that, I do not know if we have lost sight of the fact that a proposition is not necessarily a reality; there is a proposition that the military will be handing over power. It has not happened yet. The reason why we have gone through this last couple of weeks of discourse and discussions, negotiations and consensus of all sort is to achieve peace. In fact, I must say at this moment that I commend the two political parties in this country because never in the history of Africa have I seen such co-operation between two opposing political parties like it has happened in this case. All that has been borne out of the fact that Nigerians have come to learn the saying of Churchill: â€˜It is better to jaw-jaw than to war-war.â€™ The common man in the street puts it this way: â€˜I no gree â€“ I no gree, na im dey tear cloth.â€™ And that is a fact. If both of you are dragging for something and nobody is ready to give in, definitely that thing is going to be destroyed. So, I do not want us to lose sight of the fact that whatever the military themselves had done may be wrong, but each time they did it in the past, a section of Nigerians rallied round them and supported them. Some sections, like the distinguished Senator from Adamawa Central (Senator Hamman Mohammed) said, never actually understood what they were doing and it came to pass that today we are under military rule. Now, the alternative to accepting the situation we have on hand is that we are going to have a situation where both parties of the divide refuse to agree. Let us not forget that the only weapon that we as civilians have are our brains and our hands, and perhaps the population behinds us.Â The military have guns. You can say that civil power is popular power, yes. There is popular power; we can use it against the military, but you need to mobilize them. Even when you do mobilize them I would like us to cast our minds back to countries where popular power had removed dictatorial government from power. What has happened to these countries? Look at Sudan: What is the state of Sudan today?Â You will remove the military from power all right, but what happens to the country thereafter? Look at Somalia. What is the state of Somalia today? What is the state of Liberia today? This is not to talk of Ethiopia. Eventually, Ethiopia is cracking up. These countries, I do not think by any stretch of imagination, are as diverse in ethnicity or in tribal differences like Nigeria is. And if they could not hold, I wonder what is going to happen to Nigeria. Therefore, I want us to address the end, not the means. So as long as we achieve the end, the means will justify that, and in this case, if we want to go on an ego-trip of making a fuss about how you do this or who is getting what and so on, this is not going to help us. Therefore, I will like to suggest that what we now have on hand is a State-of-the-Nation address from the President and Commander-in-Chief of the Armed Forces of the Federal Republic of Nigeria; who we did not put in power, and we cannot remove from power unless by negotiation. He has opted to step aside, and I think it is only just proper if we do not want to deceive ourselves, for us to recognize that fact and say: Thank you very much. (Applause). We also must not sight of the fact that for the past eight or nine months since we have been here, we have been unable to discuss anything. Infact, sometimes I am embarrassed to be called a Senator, because I actually cannot say what I am doing here. And then suddenly in this state-of-the-nation address, the man says he is handing over to you full constitutional powers; he did not give any exceptions. So how can we sit down here and, could not at the very least, say: Thank you very much? (Applause) And, we being representatives of the nation should look at this and say; well, this is a way forward from the status quo. That in itself is progress and so we should adopt it while we wait for the instrument of the interim government. At that time, we can now examine that instrument in detail vis-Ã -vis this address and then we can debate it for two weeks if possible. After seeing the instrument which is a decree, we can debate for even one month until we arrive at a consensus. That will bring our problems to an end. So, Mr. Chairman, I want to propose that we take a step-by-step approach to this problem. And, if we do agree that we should, we can defer detailed discussion on the address till we obtain the decree on the Interim National Government. If you do agree, I so move, Mr. Chairman. The Chairman: Please, distinguished colleagues, I like the orderly manner in which we are now conducting the discussion. It is a serious issue that requires very sober reflections and serious contributions. I would like, before I call other colleagues, distinguished senators to take serious note of three key points raised by the Minority Leader that: (i) the president has offered to voluntarily step aside; (ii) need may be, to defer and wait for the legal instrument before detailed positions could be taken. This is not to say that it is a summary of what we are discussing. But I think they are important points which need to be underlined while we continue with the debate.Â Minority Leader, did you put it as a motion? The Chairman: Alright. It is a motion. There is no Rule which says that a motion may be put only at the last part. It can be right from the beginning. So, I am not stopping anybody form moving a motion. Any seconder? Senator Chuba Okadigbo (Anambra North): Yes. The Chairman: There is an amendment from Senator Chuba Okadigbo. Minority Leader, may be you will like to phrase your motion properly. You can go on Senator Okadigbo. Senator Chuba Okadigbo: Mr. Chairman, distinguished Senators, I beg to amend the motion moved by Senator Birabi as follows: In pursuance of his motion, the Senate shall proceed to the motion on the Order Paper which intends to have the Senate pass a motion on Interim National Government vis-Ã -vis the powers of the National Assembly, as in the Order Paper provided. I beg to amend. Thank you very much. The Chairman: Senator Birabi, do you accept the amendment? Senator Birabi: No, Mr. Chairman, I think my motion should carry if it is so popular; and subsequently, we can look into it on its own merit. The Chairman: Please, may we allow the distinguished Senator for Rivers East (Senator Birabi) to drop the motion if there are no further amendments so that it can be read out to us. From there, maybe we can proceed to counter motion. May I call on distinguished Senator Birabi to read out the written version of his motion. Senator Bennett Birabi (River East): Mr. Chairman, distinguished Senators, the motion reads thus: That this Senate express its gratitude to the President and Commander-in-Chief of the Armed Forces of Nigeria and accept: The Interim National Government as a step forward. That the military has voluntarily accepted to step aside.Â That the Senate without prejudice to further debate on this issue awaits the instrument of the Interim National Government before further detailed debate can continue. Senator Chuba Okadigbo (Anambra North): Counter-motion, Sir. The Chairman: Any further amendment? Senator Chuba Okadigbo: Counter-motion, sir. The Chairman: It was seconded by Senator Kanti Bello. I want to draw the attention of Senator Birabi to the fact that it was the President and Commander-in-Chief who offered to step aside. So, it has been corrected. Any counter motion? Senator Chuba Okadigbo: Yes, Mr. Chairman, I have a counter motion. The Chairman: Let us have the amendments first. Senator Anthony O Adefuye (Lagos East):Â Have I been given the floor? Senator Anthony O. Adefuye: Mr. Chairman, distinguished Senators, I just want to delete the first item which says that we accept the principle of the Interim National Government.Â This is because the last paragraph says we want the instrument before we further deliberate on the Interim National Government, and that is very contradictory. Now, we are a Senate and we are democratically elected Senators. I do not think it is to our advantage to start accepting the principles of Interim National Government here. I think the way the thing has been put before has protected us from the people who put us here, and it says that, well, we accept his offer to step aside. Secondly, we accept that he is giving us back full powers. Thirdly, he should put the instrument before us for further deliberation on the principles of Interim National Government.Â I think we should keep to that. The Chairman: Minority Leader, do you accept the amendment? Senator Bennett Birabi (River East): Mr. Chairman, distinguished Senators, I do not want to accept the amendment for the following reasons. We are talking of negotiations. We are discussing and we are talking to somebody who is in a position of strength in his own rights. What is happening here, even in the text of the speech, is that he made no pretences about the fact that we are the weaker party. If we have the power to remove him from office, he probably would not be here. He said he has offered to step aside. They have not given us much options but we are aware of the process of arrival at the option of Interim National Government. We have been there, we were turned back, and we went back with the option, and they returned to us the option of Interim National Government. They have not given us many options, but I want us to address our minds to the fact that if we insist on what we think is right, then we are not likely to go any further. If we have to make progress, I think that we should accept what has been offered. Then we can go for discussion to see how things can get better until such a time when we are in a position to define the issue. The Chairman: Are you accepting the principle of Interim National Government or are you accepting the Interim National Government? Senator Bennett Birabi: We are accepting the principle of Interim National Government for now. The Chairman: Thank you very much. There are now two motions on the floor and before we vote on them, there may be people who may want to speak on their motions. Beginning with the counter-motion, I call on Senator Okadigbo to lead discussion on this counter-motion. Please, may you go through your motion very carefully, after which you can then highlight the salient points of the motion. Explanation given when dealing with item (c) applies mutatis mutandis to item (d). With respect to item (e), it says: The Senate appreciates the restoration of the full powers of the National Assembly, and hereby reaffirms the will of Senators to use such powers in accordance with our solemn oath of office. We want our powers in their fullest, and as given in bodies of laws in the Social Contract and in the Constitution. The supreme law of the land is the Constitution, which unfortunately, is at the moment in abeyance, according to the Attorney-General of the Federation. May that abeyance cease as soon as possible so that this country shall move on the path of freedom and democracy to enable us do what we are expected to do, namely, to contribute our positive quota to the maximization of the general welfare for the good people of the Federal Republic of Nigeria. The Chairman: We are now speaking on the counter motion, so we are not moving or seconding any motion again. We have gone beyond the issue of moving or countering motions. We are strictly speaking on the first counter motion by Senator Okadigbo. After we have concluded debate on that, we will vote on it, if it is not carried, then you know the obvious decision. Senator Jubril Martins-Kuye (Ogun East): Mr. Chairman and my distinguished Colleagues, I had wanted to resist the temptation to shower encomiums on Senator Chuba Okadigbo on his motion, but because Senator Ahmadu Ali has succeeded in his bid that we all sit here, talking till 9 p.m., I can as well begin by paying him due compliments. Mr. Chairman and my distinguished colleagues, if you read the counter motion very well, you will pay due compliments to Dr. Chuba Okadigbo, a distinguished Senator, for his conception and presentation. He had thanked Mr. President. It is conventional to thank the head of the executive arm of government whenever such a head interacts positively with the legislature. But I am much more touched by what he has to say in item (b) of the motion. He says: The Senate has been honoured and privileged to be addressed on the decisionsâ€¦.What the distinguished Senator Okadigbo is saying or acknowledging is that we were never consulted to make any input into the Interim National Government idea, and we have no business debating the merit of it. Nevertheless, the President and Commander-in-Chief of the Armed Forces had deferred to our right to know what is going on. So, he had also acknowledged that any statement made in the regard is duly noted, and I think that that is very proper. All that this item (b) is saying here is that, well, it is duly noted, I am very happy, personally, to go along with that â€“ it is noted. Finally, Mr. Chairman, when we look at item, (c) that is also merely saying that we are happy to receive our powers. I congratulate distinguished Senator Chuba Okadigbo on the note of caution. The statement by Mr. President and Commander-in-Chief of the Armed Forces, as being quoted, just merely talks about the Legislature playing crucial roles. But what these roles are going to be, nobody knows.Â When we read that in conjunction with what he had to say on page 23, he is talking of an omnibus decree in which the powers and responsibilities of the judiciary, the legislature and the executive arms of government would be incorporated. Until we know what the omnibus decree, a kind of miniature constitution, is saying we cannot properly assimilate the scope of our powers.Â So, this item (b) is talking about being cautious. It is not comforting; it is merely noting the information passed to us. I am very happy to note such information. On the Interim National Government, this Senate should not make extensive comment on it by way of approval. This is because every segment of Nigerian society was consulted, but the Senate, as an institutional body, was not consulted. It was merely foisted on us. Since we do not want to cause confusion, and since we do not promote disorder, all we can do is to live with the idea, or to say that we note the fact that that is the mode of resolution of the political impasse. So, this is merely a matter of noting. It shows the genius in Senator Chuba Okadigbo as an accomplished political scientist. I think I want to go along with this, and I want to implore everybody to go along with it. Thank you, Mr. Chairman.Â (Applause). Senator Idris Kuta Ibrahim (Niger East): Mr. Chairman, my distinguished Colleagues, I would like to crave your indulgence just to comment on the motion of Senator Chuba Okadigbo, and what Senator Martin-Kuye has given a rider to. We should not look at the address in isolation, we should look at it with the Report of the Tripartite Committee. Some Senators: We have no copy of the Report. Senator Kuta: Fortunately, it has been circulated, and I think I got a copy in my pigeon hole. The Chairman: No, that is not before the Senate. The Chairman: Yes, it is an extraneous matter, and please may you confine yourself to the matter before us. Senator Kuta: Alright, Sir, Mr. Chairman, it is a fact that the political parties and some of the former presidential aspirants plus some members of the armed forces sat together to arrive at the decision which Mr. President communicated to us in his presidential address.Â Obviously, the Senate or the National Assembly was never a party with those that sat and arrived at the decision on the Interim National Government. The much we have read about it was that the National Assembly, and in fact, the political structures that have been put in place by the Babangida administration, that is from the Local Government to the State Assemblies, to the Governors and to the National Assembly, were supposed to have been dismantled. The two political parties that were requested to be re-structured, in actual fact, would have necessitated the dissolution of the present House of Representatives, because the recommendation, which I believe Mr. President rejected, was that the size of the House of Representatives was large and cumbersome and the number should be reduced by half.Â This means that two Local Government Areas are to produce one member each in the House of Representatives.Â If that were to happen, it would have meant the dissolution of the House. Now, I do not know the position of the Senate; I believe that the Senate was not regarded to be cumbersome and that the number of the members of the Senate could remain as it is today, that is 91. Now, if that is the case, Mr. Chairman, I believe the president took us into confidence by divulging how his mind is working for the first time on the 17th of August, 1993; to the Joint Session of the National Assembly. I believe what the president has done was to bring us into realizing that we have an important role to play in the current political impasse. Mr. Chairman, as we are sitting here today, the most important point which the president brought about and which this National Assembly should take seriously, is that there are people who are trying to take up political leadership through the back door.Â It has been said that anybody who wants to lead this country must go to the grassroots to start from there before he comes up to either the Local Government Council or the State Assembly or to be the Governor or a member of the National Assembly and then the president of Nigeria. If we are going to have an Interim National Government and that the president has offered to step aside, what I expect of this Senate is that this Senate should guide and advise on how the head of that Interim National Government and those executives who are to serve with the head of the Interim National Government will be elected or selected. And I believe, Mr. Chairman, with due respect, that the president is telling us that there are people who had given suggestions of names of those who should fit into the Interim National Government and none of the names that had been suggested by those people included any of the elected representatives of the people either from the Local Government, the State Level, the Governors or members of the National Assembly. Chairman: Please, Senator Kuta, that may be a very privileged information to you. As far as this august body is concerned, we do not know the details of the Interim National Government and the motion and counter-motion on the floor carefully avoids that. Once you try to bring it in, it will constitute an irrelevance and I may be forced to overrule you on that. Senator Kuta: Mr. Chairman, I regard this Senate to be the apex of legislature in the country and I regard every Senate here as a responsible person and I think that it will be criminal on my part if I received an information and kept that information to myself. I think we would be doing a disservice to this nation. As a Senator, one should be open to listen and to hear and to sound the minds of a lot of people. Therefore, Mr. Chairman, whether this information is privileged or you are not aware of it, I believe that as a Second Republic senator and a senior Senator for that matter as well as the only Senator returned unopposed in the whole federation, I am giving you the benefit of my knowledge and experience because I told you even before you were addressed by the president and Commander-in-Chief of the country that I believe and I continue to believe that the president of the Federal Republic of Nigeria is going to come out from the National Assembly. So, Mr. Chairman and members of the Senate, you have to grease your palms because we are ready to face the battle.Â As an interim measure I will only be too happy if the chairman will now as a start, begin to head the Interim National Government. Thank you, Mr. Chairman. The Chairman: Again, let me remind distinguished colleagues that by necessary implication, by debating the counter motion you are debating the substantive motion. So, what we are doing is by implication debating two motions. So do not imagine that there is a separate time for you to come and debate the substantive motion. Senator Fidelis C. Okoro (Enugu East):Â Point of Order, Mr. Chairman. The Chairman: What order please? Senator Fidelis C. Okoro: Mr. Chairman, with due respect, my point of order is Order 37(3). I remember that the Chairman did draw the attention of all of us to this order. In other words, he did advocate that we should as much as possible be brief to contribute. The fact that we have agreed to stay till 9pm does not mean that one Senator should take the floor for the whole day.Â So, I am advocating that we should keep strictly to Order 37 (3), as has been referred to by the Chairman. The Chairman: The point of order is upheld. Our rules state that no senator should speak for more than 40 minutes and where we say people should be brief, I run short of fixing time because it is an important issue. But I do not think it is proper that people should take 20 minutes which is half of that 40 minutes. So, Senator Adefuye, I am giving you only one more minute to round up your contribution or I will stop you whenever I think it is appropriate. The Chairman: The chairman is final. I think we must follow the Rules of Procedure. Senator Anthony Adefuye: I know the Chairman is final, but some Senators have spoken here for 20 minutes. I have only spoken for 10 minutes. If you do not want us to continue, we can leave. The Chairman: Senator Adefuye should sit down. Senator Anietie Udo Okon (Akwa Ibom North East): Thank you, Mr. Chairman, I would like to crave your assistance in following me refer to some short notes that I have made for guidance purposes. Thank you. The Chairman: The distinguished Senator for Akwa Ibom North East (Senator Anietie Okon) should please sit down while the distinguished Senator for Lagos East (Senator Adefuye) should please complete his presentation. Â I had earlier given him one minute. It is the point of arguing with the Chair that I did not take kindly to. â€œThis is because in this last stage of our drive towards the full realization of the third Republic, the National Assembly is that body at the Federal level which has the grassroots constituency; and therefore, the anchor for popular rule.Â Being popularly elected, you should now provide the link between the Interim National Government and the representative will of our people.â€™ It is not proper to use the legitimacy of the National Assembly to back up the illegitimacy of an appointed Interim National Government.â€ It is not done anywhere in the world. The proper thing to do is to hand over to the National Assembly which will then provide an Interim Government for the people as specified by law, unless there are other reasons for not wanting to hand over to the National Assembly, probably because it is the same party which won the presidential election purported to have been annulled that is also controlling the National Assembly. Distinguished Senators, the result of the June 12 presidential election has already been released at the polling booths, at the ward level, at the local government level and at the state level. At the federal level, the results of 29 states and Abuja have already been collated and accepted by the National Electoral Commission. (Interruptions). Mr. Chairman, please protect me. There remained only the result from Taraba State. This election was conducted in the glare of the whole world which was invited to witness the historic occasion. Now, the election was adjudged free, fair and peaceful, and the best ever conducted in the history of Nigeria. From nowhere, somebody obtained a court injunction to stop the release of the election results. The federal government quickly, without any valid reason, annulled the result of the election. Now, the reason given for the annulment was that too much money was spent at the election and that an injunction was earlier obtained. One thing was clear however, that the candidate of the Social Democratic Party, Chief M.K.O Abiola, was leading comfortably with a majority of over two million votes from the result of the 14 States that were released. From the result released by the 30 State Electoral Commissioners and signed by the agents of the two candidates, Chief M.K.O Abiola won convincingly. He won more than one-third of the total votes cast in 28 states and he won with clear majority in 19 States and Abuja. The governmentâ€™s statement on June 12 presidential election, therefore, does not reflect the judgment of most Nigerians and the international community. The nullification of the June 12 presidential election is, therefore, illegal and must not be allowed to stand. We are the custodians of the democratic principles of the collective mandate of Nigerians. We must, therefore, uphold that mandate and refuse to be intimidated, by anybody; no matter how highly placed. The whole world awaits our decision and the decision will also reflect if we are mature for democratic rule. We are at a crossroads. The amber light is on. Our decision will decide whether it should turn green or red. We must shun any form of government which is not democratically elected. The Interim National Government is a bait. We were not part of the decision for the Interim National Government, neither were we during the national consultation of all interest groups. Now, we are expected to give legality to illegality.Â (Interruption). The Chairman: Senator Adefuye, please conclude your contribution. Senator Adefuye: In view of the provisions of Decree 53 which has not been abrogated or annulled, whatever opinion the Senate, therefore, expresses on this issue would be illegal, null and void and, therefore, of no effect. Even though the President and Commander-in-Chief has promised to give us back our full legislative powers, that does not restore the power for us to confer legitimacy on any Interim Government, except as contained in Section 144, paragraph 2 of the 1989 Constitution. We are yet to be informed to the details of the Interim National Government. Who will approve the list of those to serve on the Interim Government? Even if there is need for this government, should we not receive the details first before now, as we did during our inauguration after which gigantic Decree 53 surfaced. There are decrees being prepared now for the Interim Government. Should these decrees not be made available first before we consider the position of the Interim National Government? Distinguished senators, once bitten twice shy, we should not be rushed into taking any decision that will make us look stupid in the eyes of the whole world. There is a popular saying: look before your leap.Â If we are taking any decision today, the decision would be that we justify the peopleâ€™s mandate as demonstrated on June 12, 1993. Any arrangement not based on June 12 will make us unpopular with our people and will ridicule our respected National Assembly in the eyes of the world. Senator Uba Ahmed (Bauchi East): Mr. Chairman, I have a very important information Sir. The Chairman: It should be very brief, Senator Uba Ahmed. Senator Uba Ahmed: Yes, Sir, I will be as brief as my distinguished colleague, Senator Adefuye (Laughter). Sir, my respected and distinguished colleagues, as a very senior legislative house, I think it is very important that we take decisions based on correct information. And where the Senate is being misinformed, I think the duty rests on us to raise this point of information. My good friend, Senator Adefuye has referred to the June 12 election which I believe he accepts was conducted on the basis of Decree 13 of 1993. If we accept that all the parties contested election on the basis of the provisions of Decree 13 of 1993, the application of that decree must not be selective. The decree says an election of the president has to be done, which was done. But a clause of the decree went further to say that an election is only valid if the results of this election are declared within seven days by National Electoral Commission (NEC). That result had not been declared within 7 days by NEC. Therefore, legally, an election was never conducted on June 12, 1993. So, since there is no election there is not, therefore any question of mandate being given to any person much less to talk of acceptance or defending a mandate thereof. So, Mr. Chairman, Sir, I wish my colleagues and the citizens of this country to know that if we go by speculative results, I can even tell you, and this is a true and hones story, that the information we have now got which is very valid from very reliable sources is that, in fact, Bashir Tofa won this election (Applause). The Chairman: Order! May I request Senator Paul Wampana Vintim to pass his walking-stick which can easily become a weapon to the Sergeant-at-Arms, and when he wants to go out, it can always be returned to him. Thank you very much. Please Senator Uba Ahmed you may continue (Senator Vintin compliers). Senator Uba Ahmed: Thank you, Sir, Mr. Chairman, I admire your democratic nature and that is why I will ever be loyal to your Chairmanship. The truth of the matter, my colleagues is that the valid information on the ground today is that Tofa won that election. But as I have told you earlier on, the current provision of Decree 13 accepts and provides for the result of the election to be declared within seven days by NEC, and since NEC has not so declared Tofa the winner we are not accepting that claim here.Â (Interruptions). So, Mr. Chairman, I think it is important for the Hansard of the Senate to record Bashir Tofaâ€™s success at the June 12 poll. Thank you very much. Mr. Chairman. The Chairman: We are not going to debate indefinitely, but as the ground is thinning I will take only a very few more contributions, summaries and then ultimately, we will return to the Senate. Senator Tinubu, are you ready to speak now? Senator Bennett Birabi (River East): Point of Order, Mr. Chairman, I rely on order 31 (6) which says: No Senator shall impute improper motives to any other Senator. I want to say that the relevant section of this motion which Senator Tinubu is making reference to, that is section (c), does not in any way imply that Senator Okadigbo has accepted the Interim National Government. He only noted it, and he quoted what he noted.Â It was just a quotation; it does not decide in any way. So, I want to request that that motion be corrected.Â Thank you. The Chairman: I have taken due and legislative notice: Does that imply acceptance? Senator Azinge can you help me? Senator D.K. Azinge (Delta North): No, Mr. Chairman, Sir, it is just noted. The Chairman: What is legislative notice? Senator Azinge: Legislative notice implies that we are noting the paper being laid on the Table, and reserving our position until the ingredients are received by this august Senate. The Chairman: So, what is clear is that this Senate is not endorsing any Interim National Government because we do not know what it contains. Point of Order upheld. Senator Tinubu, you may continue. Senator Tinubu: Thank you, Mr. Chairman. Also we have seen the agony of our people always being punished by the military, according to the scenarios that we have heard described today. Distinguished Senators, we have a situation today that suggests that the abortion of June 12 election is another coup dâ€™etat; it can be termed as another coup dâ€™etat.Â My question is, when are we going to stop tolerating injustices, coup dâ€™etat and abuse by the people on whom we invested so much resources â€“ the public funds of this country? The highest portion of Nigerian budgets since independence is being invested on the military, from their barracks to the ammunitions purchased for them and up to their uniforms. The oath of office taken by the military is to protect the citizens and the sovereignty of this country. It is a matter of conscience. Should we continue to tolerate the situation where the military turn that investment against us, to abuse, to restrict and to prevent justice taking place? Yes, it is true that we have a crisis, but to every action there must be a reaction. This is a self-inflicted crisis because without the abortion or annulment of the June 12 election, there would be no crisis like this. We have a government that made law and abused its own law. Therefore, the present military administration, by virtue of abrogation and violation of its own decree has committed a crime. Be that as it may, we are now looking for the restoration of our powers. I wish this distinguished Senate to pay attention and seek clarification.Â I have seen another booby-trap in the present speech. The booby trap is the offer by Mr. President to step aside. The president should give us a decisive position. This request should also be in the letter requesting for other details. We welcome his decision to step aside, but we want decisive details to show as he promised that this is the final military government that will ever emerge in the governance of this country. Senator Sunday Bolorunduro Awoniyi (Kogi West): Mr. Chairman, distinguished Senators, I speak here as a Senator of the Federal Republic of Nigeria and not as a Senator of my senatorial district. We are passing through a very difficult time and I want to hinge my contribution to what the Senator from Adamawa Central (Senator Hamman Bello Muhammad) said: appealing to those who are aggrieved by the decision to annul the 12 June election to think of a tomorrow. Our situation in Nigeria today demands the patience of a Job and the wisdom of a Solomon and it is my prayer that God will give us both. Senator Awoniyi: That great ruler of Israel, David had moments of joy and moments of great sorrow. The story is told that he called the wise men of his court to go and find a simple statement that would be useful in times of joy and in times of sorrow. They tried for days and did not succeed until they approached his son, Solomon, who gave them the answer. Very simple, he said, it should be inscribed on the ring these four words: â€˜This too, shall pass.â€™ In times of sorrow, and in times of disagreement, if we can only realize that such moments too will pass or that there is a future, it will be heart lifting. In moments of great joy, â€˜this too shall passâ€™ makes it possible for one to remember not to over rejoice because there may be those who are in sorrow. I commend this to this Senate. As for wisdom, it is a story too that I am going to tell you, related to those great men of Israel. Alexander the Great, the Macedonian prince, with his army swept through Asia Minor and into the Palestine and saw the beautiful temple built by the Jews to the glorification of the holy name of their God. He loved it and decided that the temple had to be named after him. Naturally, to the Jews this was sacrilege and the high priest was in great difficulty: how could he refuse the conqueror of the world this request?Â It could mean execution for him and his people. He therefore prayed for inspiration and wisdom. So he told Alexander the Great: â€˜We would do better than just naming a building after you: we would not name this building after you, we would name every male born throughout that year after you Alexander.â€™ He agreed. Today, some people would have wished to be Martyrs and would have resisted Alexander and would have been destroyed, the temple along with them. 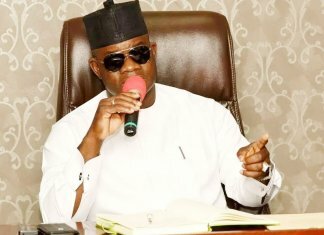 To those who are still aggrieved, I give you those two stories that please act as there is a future as Senator Hamman Bello Muhammed told you, and let us have the wisdom of a Solomon in what we say and in what we do. For me as a person, June 12 up to now has been a wonderful experience because it is very interesting that those who stand on it most of whom I knew in the past happen to have been men who are the greatest autocrats, unreasonable rulers as chief executives of their states. Also, what people tell me in private about their feeling regarding June 12 election is quite different from what I see them advocate on the pages of newspapers a couple of days later. Gentlemen, there is fear. People are afraid that they could be attacked personally, their family wrecked and their businesses destroyed if they did not stand by the June 12 election. We can appreciate that type of fear and to deal with it calls for the courage of a peculiar type which is not easy when your families and your livelihood are in danger.Â I accept that we do not want to be traduced: we want to be praised, but you do not appear in a posture of intransigence more in public than you do in a private discussion and this needs a little bit of balancing. In conclusion, I just want to suggest that from my little experience and the reading of history, it is not always wise to start a battle which you cannot win.Â I will just give you something which is a matter of record. You should look into any averagely reasonable Whoâ€™s Who for the details about General Babangida. Here is a man who is an armoured officer trained in the best armoured schools and armoured centres, in Britain and in the United States; Here is a man who in his career won a civil honour of Commander of the Federal Republic and who in his military career wears the Defence Service Medal, the National Service Medal, the Royal Service Medal; The Forcesâ€™ Service Star, the General Service Medal and the first set of graduates of the Institute of Policy and Strategic Studies in Kuru, Jos. This is the man whom some people say they want to take on. If you saw him read the address annulling this election are you not really throwing your supporters and innocent people into danger? If you say you are going to be intransigent, what have you really got? A Senator: What about David and Goliath? Senator Awoniyi: You would find out that David had a sling but you have nothing. (Laughter) Mr. Chairman, Sir, distinguished Senators, what I fear most is crisis. And, as we listened to the Minority Leader giving examples of countries which have witnessed crises at different times, you would see that these countriesâ€™ leaders were tolerable and when they would not yield they went into negotiations. Six months later, distinguished Senators those leaders wish that they were more tolerable six months earlier. That is the nature of crisis. Mr. Chairman, Sir, I hope that with this little contribution, I have tried to be brief. The Chairman: I will allow only two more contributions. For today, Senator Ladoja and Senator Oboro will end the discussion â€“ (Laughter). Senator R.A. Ladoja (Oyo South): Mr. Chairman, distinguished Senators, I have listened to everything being said by my colleagues, and adequate notes have beenâ€¦ (Applause)Â But there is one aspect that has not been taken. The President came here and told us something which we have not touched. I will tell you what he said. He said this programme is not marketable enough.Â Do you believe it is marketable enough? Today, we have to let the government know that we are going democratic. For us to go democratic the only way forward is to do away with the decree and that is the situation. If the President wants this thing to be sold, he must make it the more detailed for us by presenting to us the details of the Interim Government, and also assuring us that the constitution will be the supreme law of this country. Thank you (Applause). Senator Felix O. Oboro (River West): Mr. Chairman, my colleagues, I thank you very much that I am going to conclude this discussion today. I want to bring this debate back to the main topic. And the main topic is the motion by Senator Chuba Okadigbo based on the presidentâ€™s address; and I do not want to repeat what other Senators had earlier said. But I want to make brief comments on those who are still very steadfast on the June 12 election. We would bear in mind that the last time we met the President; our Senate President was asked by the press what he felt on the Interim Government and June 12. I rightly appreciated the response of our Senate President when he said that the press should go to the spokesmen for the parties. I do not want us to comment further on the issue of June 12 here, it is a matter that has to be handled by the party authorities. We accepted to be inaugurated by the president on 5th December, 1992; that is we accepted to be sworn in by a military government. And what we are passing through now is what we envisaged.Â (Interruptions) So, for somebody to stand here and say that because we were elected, the man has no right to do what he wants to do, I think we need to be patient, and I want everybody to be patient a bit. The Chairman: Thank you very much. For the motions on the floor, I want only a few more contributions before I put the question. Some Distinguished Senators: No! No!! The Chairman: Senator Ahmadu Ali, if you all recall, I tried at the beginning to make some proposals on the motions and the counter motions. I have good reasons for making that proposal, but it was objected to and we carried on with the discussion. I will indicate that when I tried to reconcile the two I discovered that it was only in two paragraphs that there was any difference. Out of five paragraphs the differences were very minor but important. The first difference has to do with the inclusion in the original motion that the Senate notes that the President and Commander-in-Chief has voluntarily offered to step aside. The significance of that incidentally was drawn up by the distinguished colleagues in their own debate, when a number of them made reference to the fact that the president actually is very courageous. 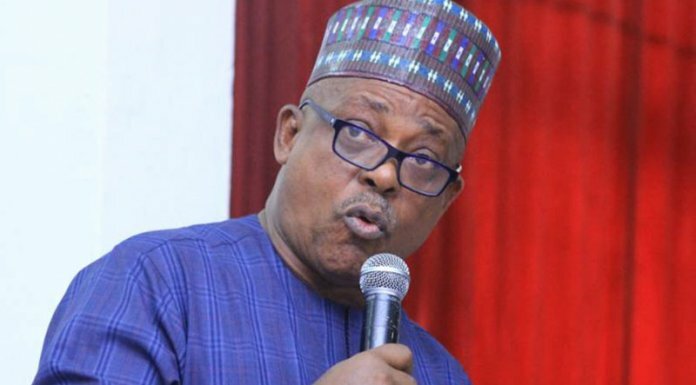 If you go through paragraph 29 of the speech, there are areas where the president has indicated that Nigerians now seem to have the general perception that General Ibrahim Babangida is the issue and hence the focus of all possible lead to the solution of the present impasse. On page 28 he again refers to the fact that many and varied attacks which hit him personally and his family have now been concentrated on him.Â I think there are several other passages which refer to various darts thrown at him and of the situation where he has been able to manage the crisis and survive. I may not be a military person, but when this type of strong wording comes from a military person, and of the day such a courageous person submits that he voluntarily has offered to step aside after exhaustive consultations with Service Chiefs, I think it is something to read very carefully. They are pregnant with meaning and they are not words to be ignored in our consideration of this very important speech. Secondly, that is the significance of the import of the original motion which included that bit which is not covered by Senator Okadigboâ€™s counter motion. The second difference is the need to wait for details before we can continue a detailed debate on the subject. That is the only difference in that particular paragraph. So, apart from these two differences, I personally did not see any difference between the motion and counter-motion. I was quite pleased to learn from Senator Okadigboâ€™s submission that they had actually discussed and put together one common motion. However, since that suggestion was not accepted by Senator Okadigbo, I then allowed the debate to continue on the motion and the counter-motion. At this point I have nothing else to say but to put the question and allow you to vote, firstly on the counter-motion. Once that is adopted or whatever we adopt, we can then proceed by summarizing what we have discussed at the Committee stage so that time permitting, we should return this night to the level of the Senate and report back to Senate. Based on that, I now proceed to put the question on the counter-motion as proposed by Senator Okadigbo. I do not think there is any need to read everything. The Chairman: At this point, I think we have finished our work at the committee stage and the summary of it is obvious. We cannot bring the resolution in place of the motion sponsored by Senator Chuba Okadigbo. Other issues are the anxieties expressed about the fears in the country, about the unity, stability and progress of the country and of the need to move forward in a peaceful atmosphere. So, after very exhaustive deliberations on various issues affecting the country based on the presidentâ€™s address, those are some of the issues which we have noted. After discussion on the issue of the Interim Government, there is need to uphold the constitution, then return of powers to the National Assembly and the role of the Armed Forces to defend the country both internally and externally as provided for in the Constitution. We will now return to the Senate and report back as briefly as possible.